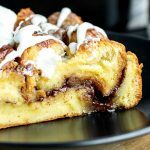 This easy Cinnamon Roll French Toast Casserole is an overnight french toast casserole with gooey cinnamon filling and drizzle of sweet cream cheese icing. 1 teaspoon Vanilla Extract if you use Dunkin’ Donuts Extra Extra Creamer Vanilla or Caramel you can skip the vanilla extract. Cut bread into large cubes (about 1 - 1.5 inch cubes). In a bowl mix together the softened butter, sugar, and 2 tablespoons of cinnamon. Set aside. In a separate bowl add eggs, milk, Dunkin Donuts Extra Extra Creamer, salt, 1 teaspoon of cinnamon, and vanilla extract (optional). Whisk together until fully combined. Set aside. Place half of the bread in a greased 9x13 inch casserole dish. Top with half of the butter, sugar, cinnamon mixture. Add the rest of the bread and top with the remaining butter, sugar, cinnamon mixture. Pour the egg mixture over the bread making sure to moisten all of it. Cover with plastic wrap and place in refrigerator for at least 3 hours, preferably overnight. When ready to bake preheat oven to 375 degrees F. when it reaches the correct temperature place the casserole in the oven and bake for 45 - 55 minutes. Once the casserole is done baking remove from oven and let cool for 10-15 minutes. While the casserole cools make the icing. Combine the cream cheese and powdered sugar, stirring together until there are no lumps. Add Dunkin’ Donuts Extra Extra creamer to the sugar & cream cheese mixture and whisk together until smooth. Drizzle the icing over the cinnamon roll french toast casserole and enjoy!